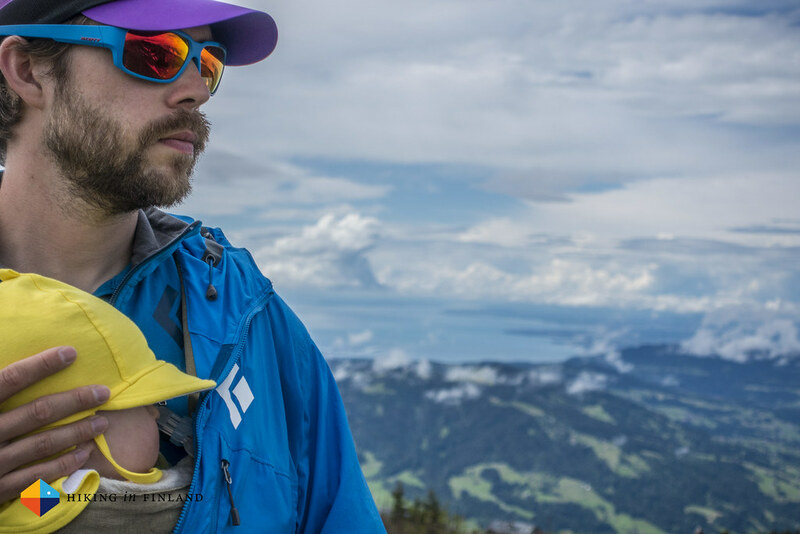 The family adventure-mountain-holiday saga from the Bregenzerwald continues with a lot of hikes and some fine views! Where did I leave off? 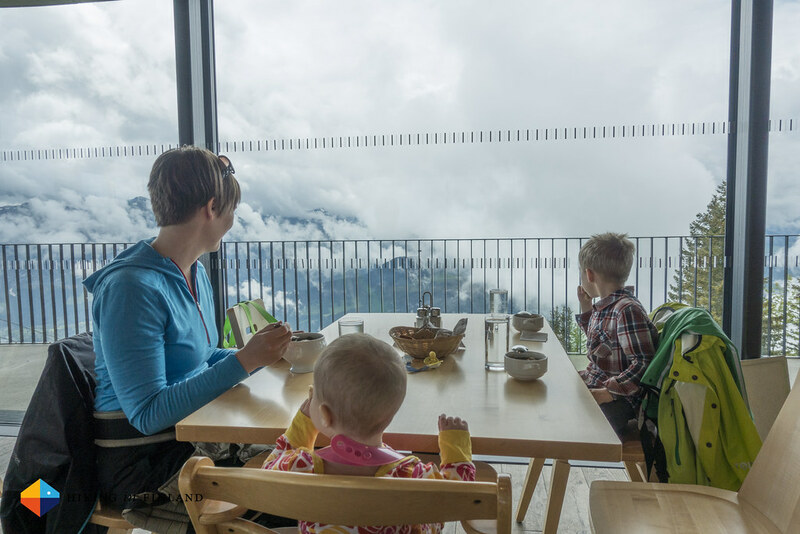 Ah yeah, that I just came back to our apartment after my Sunrise hike up the Kanisfluh, ready for a day full of family adventures. 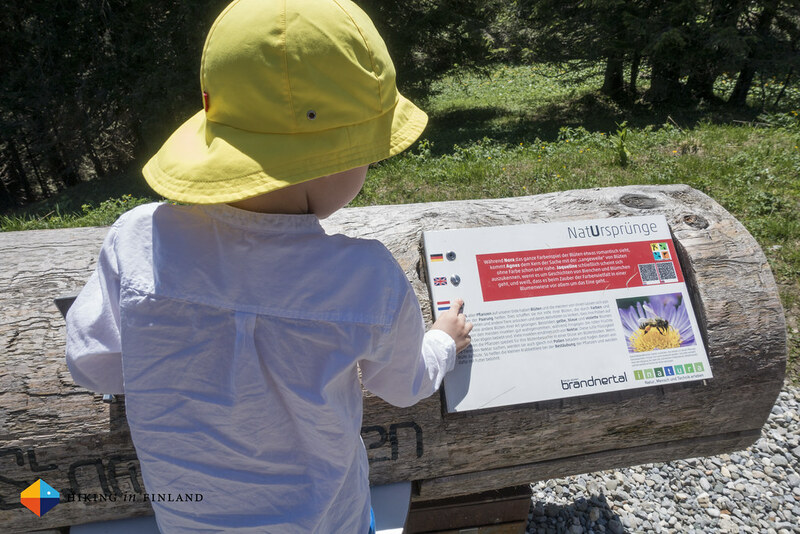 With such a good weather forecast - the first really sunny day during our stay - we decided to head to the neighbouring Brandnertal¹ and hike on the family-friendly Natursprünge-Weg Brandnertal. 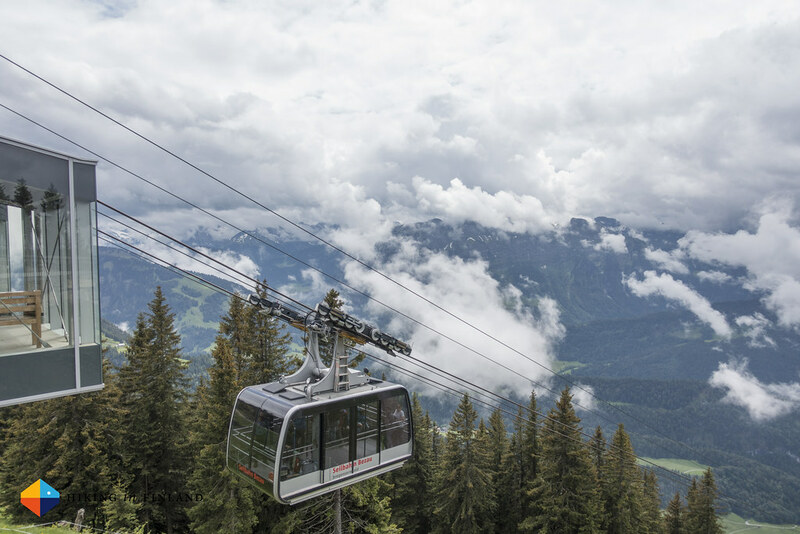 After a drive of a bit over an hour we arrived in Studa and took the Dorfbahn up the mountain. 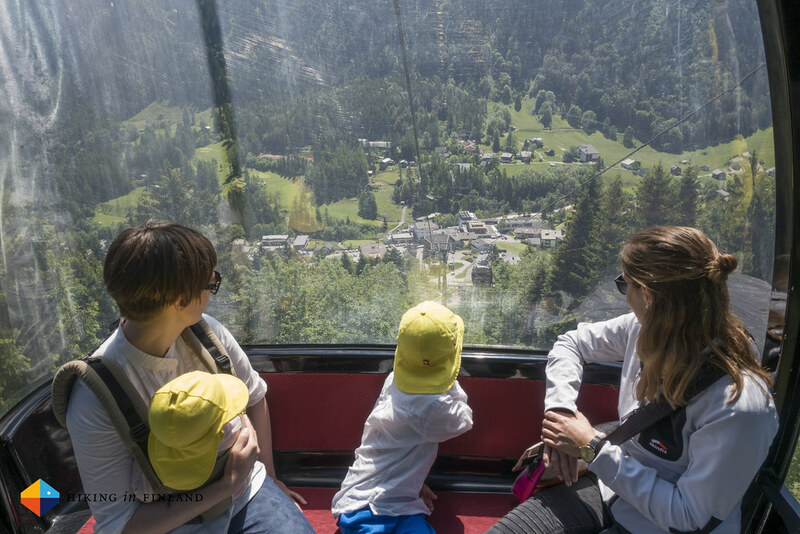 There we switched into the Panoramabahn which brought us over to the start of the nature experience trail, which has been created in cooperation with the inatura museum. 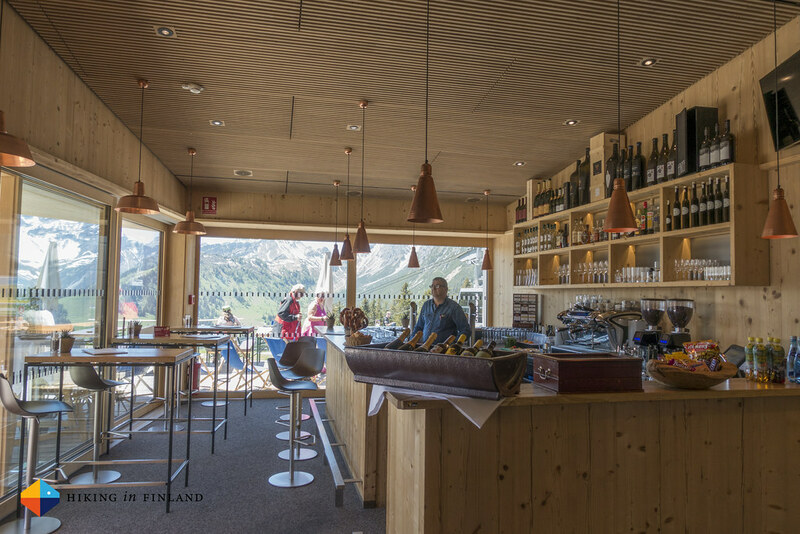 But first it was already again lunch time, and so we sat down at Frööd and ate to strengthen us for the stroll through the mountains. The food was tasty, as were their home-made lemonades, and the playground keeps kids active for a long time! 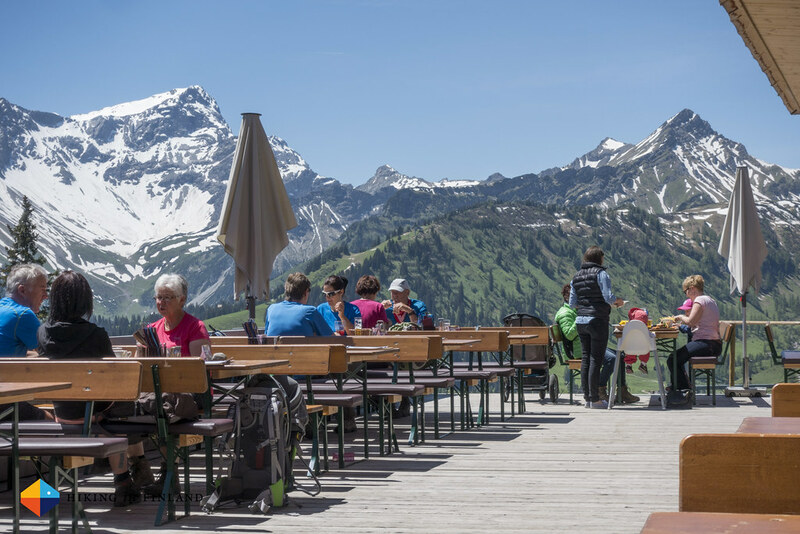 Add in great views and you might just be inclined to sit on the terrace and sip cold drinks! 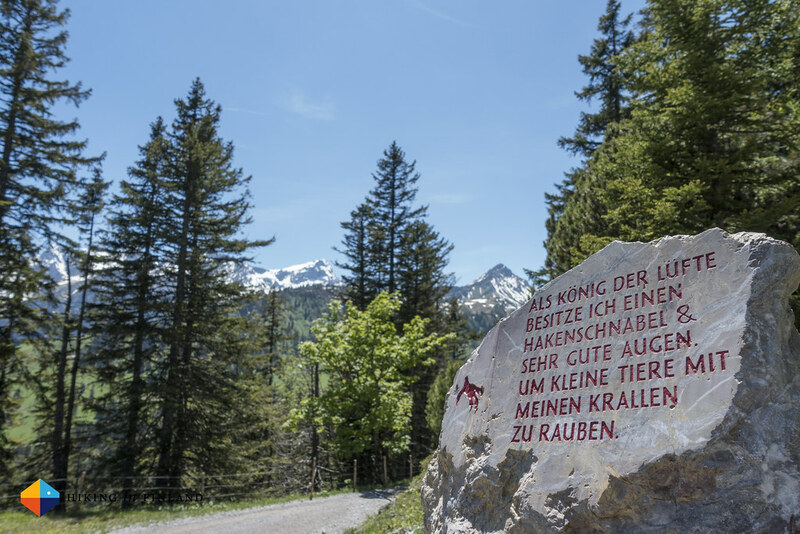 But we weren’t there to sit out a sunny day on a terrace and so we soon started to hike on the interactive Natursprünge Weg. 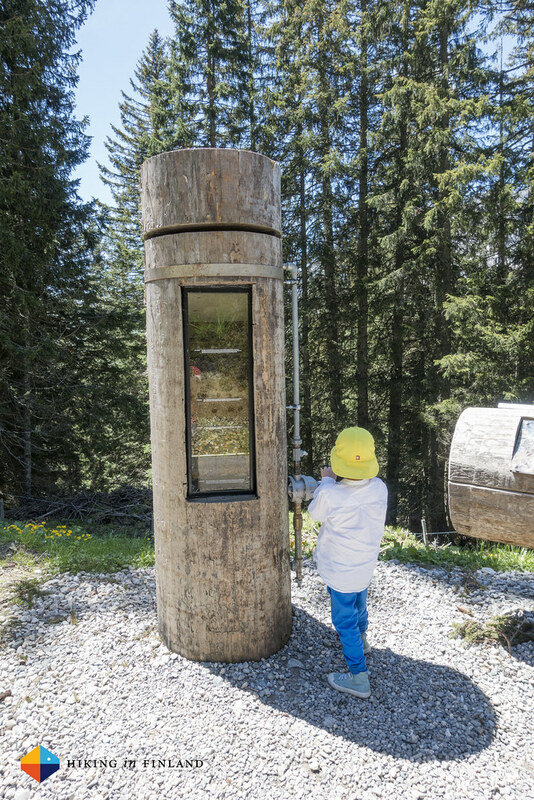 In regular distances you find information stations which explain a certain topic - from the views over geology to respect for nature, it’s a wide array of topics which you can find out about. 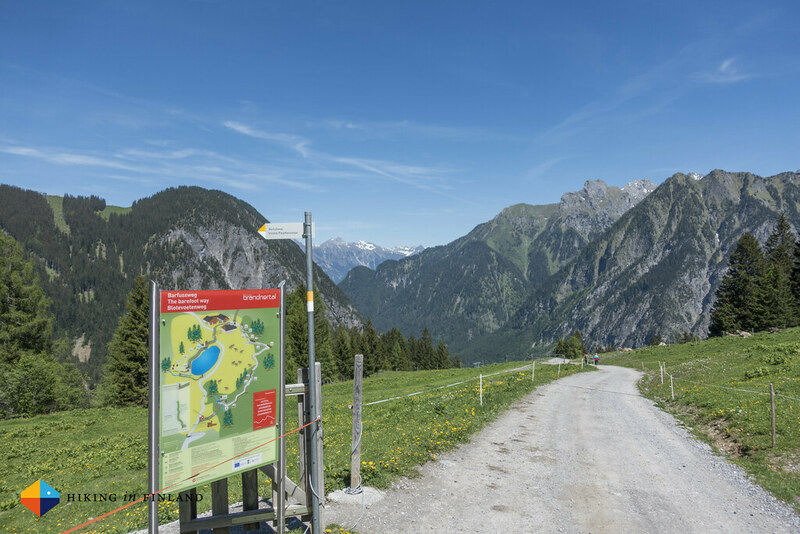 It was a wide, hard path which was OK to walk - the views were spectacular, though on a sunny day the lack of shadow could be causing trouble when on the trail with little kids, so always bring enough water, a longsleeved shirt and pants and a sun hat to protect the little hikers. Also the relative long distance (it’s around 90 minutes walking time with kids, so maybe close to 6 km) could be a problem, as there’s no shortcut. 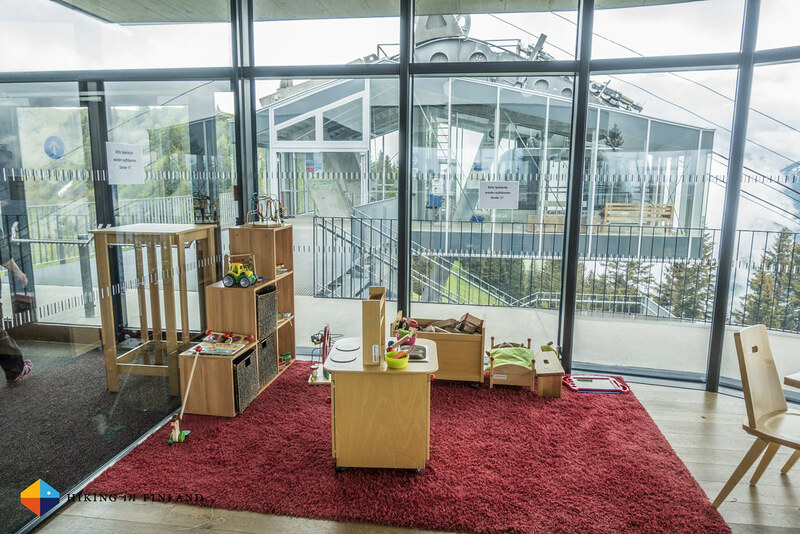 However, you can loan a handcart from the second station which would allow you to pull your kids down the trail, making it easier! At the end we passed another Restaurant and the start of a Barefoot Trail which looked pretty nice, but we just went straight for the cable car as our little one was getting pretty tired and needed to get into bed soon! 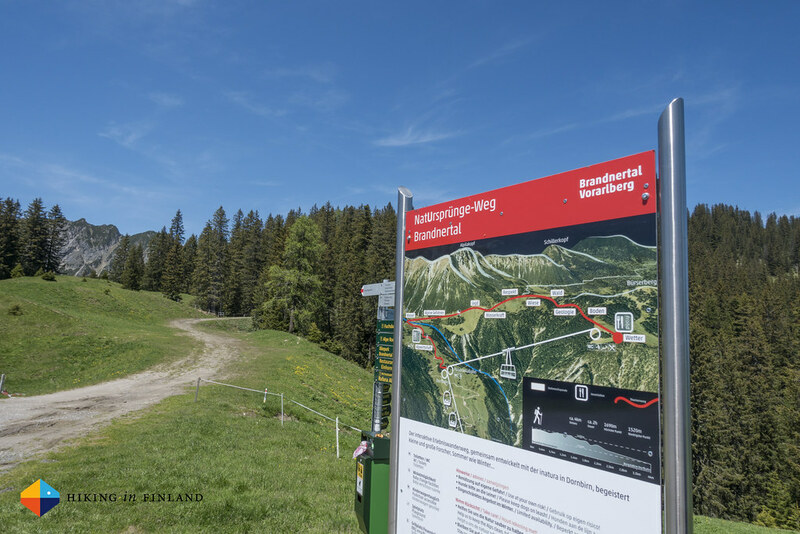 All in all the Natursprünge Trail was a good experience, but we did like the Panorama Trail in Bezau (read about it underneath) more as it was a lot prettier. 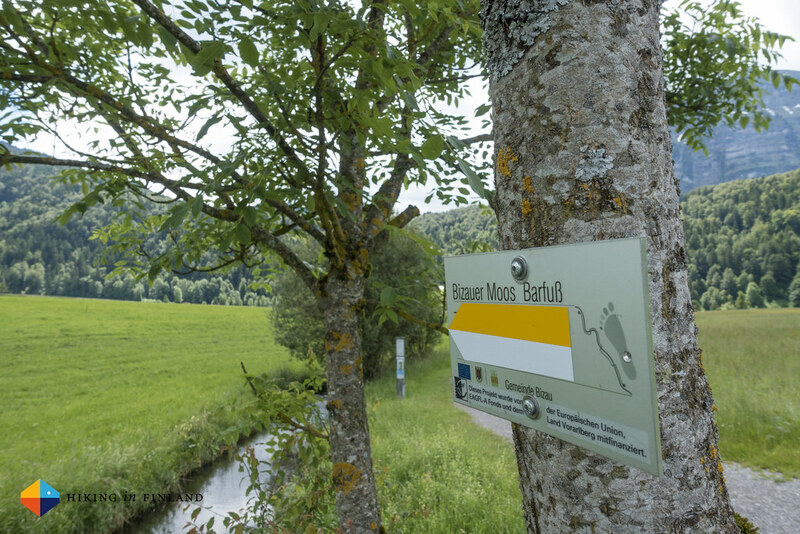 The Barfußweg Bizauer Moos is a great little hike for friends of barefoot walking! 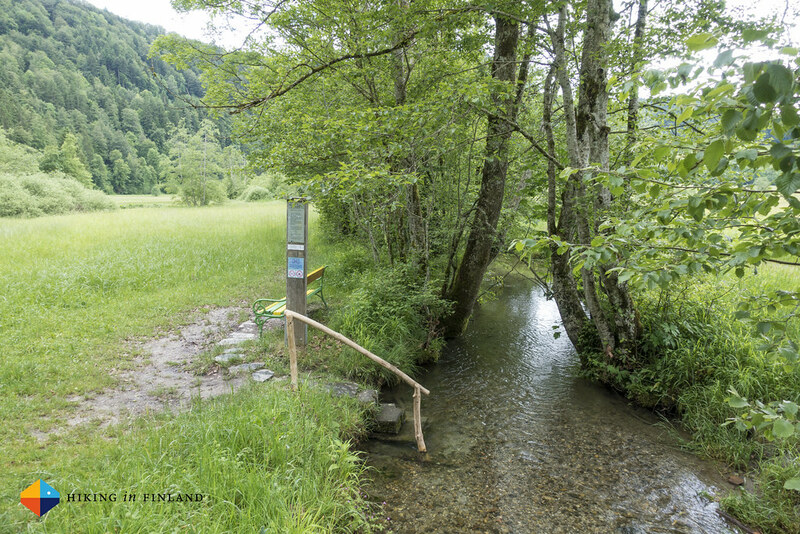 It was also very close to our apartment in Mellau - a short bus ride from Mellau to Bizau and we could start! We followed the trail markers over narrow paths and wider streets to the start of the barefoot trail, which runs all the time along the short (or through) the little Ulve creek which finds its way through the highmoor. Once we reached it we told our four year old son that we will now continue without shoes. 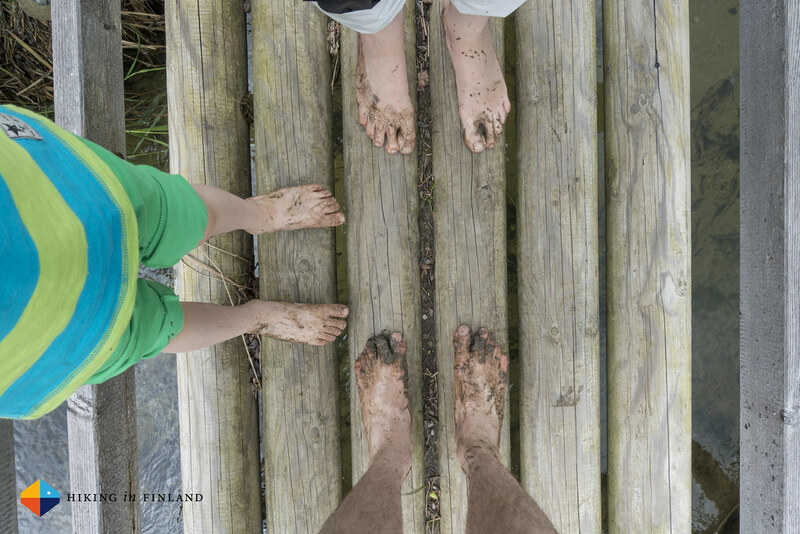 He was highly sceptical and needed some serious convincing, but after he saw that mom and dad were walking through the muddy puddles he was all in favour of barefoot hiking! The barefoot trail runs mostly on grassy trails, with a few crossings of the ice-cold creek. 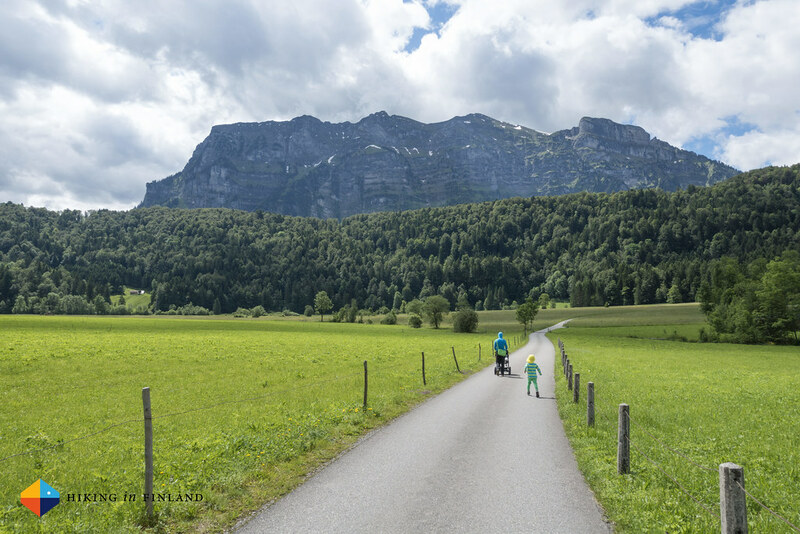 Our son really liked the ice-cold crossings, and loved it even more if he could make dad cross the creek twice =) The highmoor is beautiful, with colourful wildflowers all around and great views on the surrounding mountains. At the end the trail runs in tight curves there and back, but always along the little creek, sometimes now also on duckboards (which can be very slippery with wet, muddy feet!) but mostly on grassy trails. 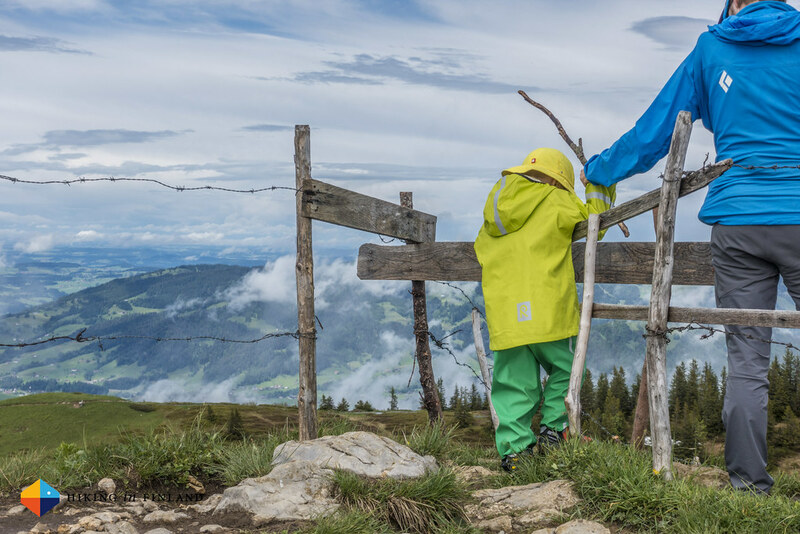 Once you see the yellow-green bench you know that you’ve made it to the end of the trail! 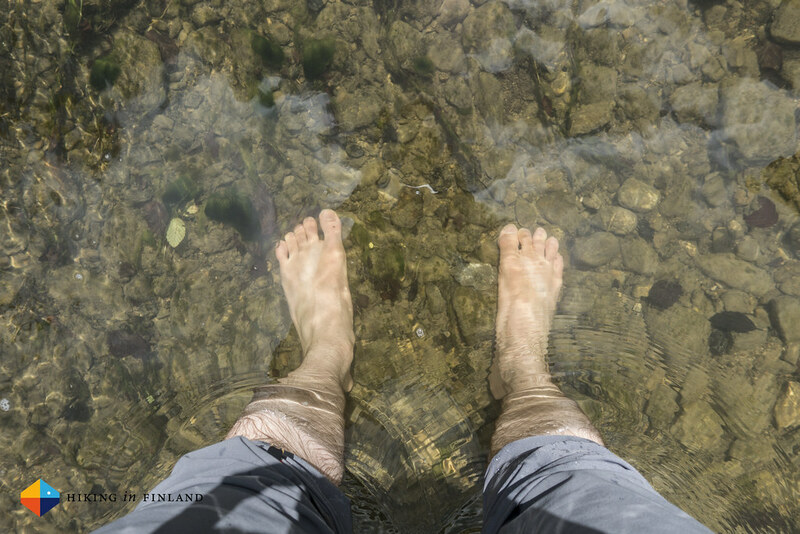 Now it’s time to wash your feet a final time in the cold creek - hopefully you brought a towel! - and get back into your shoes (unless you’re a monkey like me and have your Luna Sandals along!) 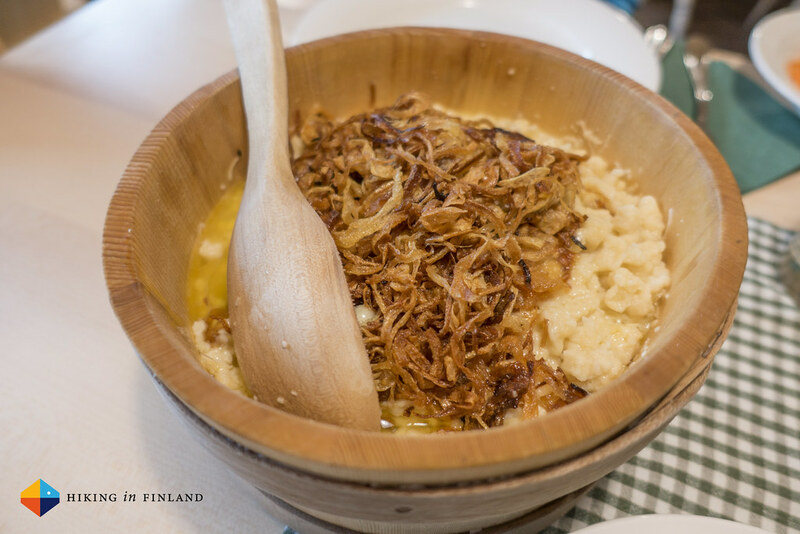 and continue - for example towards Jagdgasthaus Egender in Schönenbach, where you can taste the best Kässpätzle of the whole region! 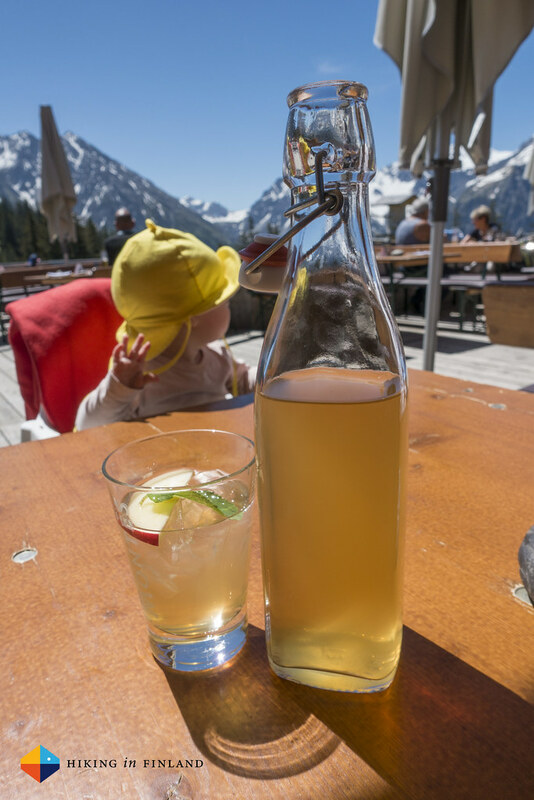 The Panaoramaweg Bezau was our absolute highlight of the trip to the Bregenzerwald in Vorarlberg. 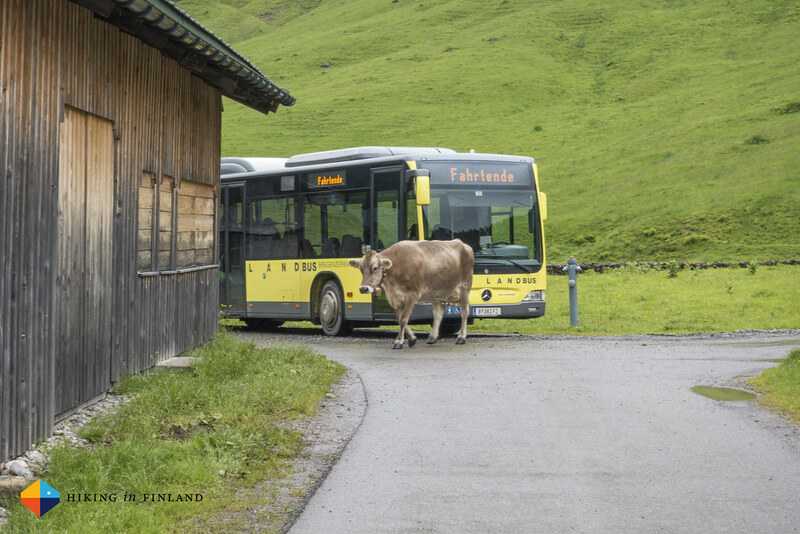 It was again very close to where we stayed in Mellau - a mere 10 minute Bus ride! - and the scenery, the lovely little path, the great Restaurant and the amazing views really made this hike stand out. 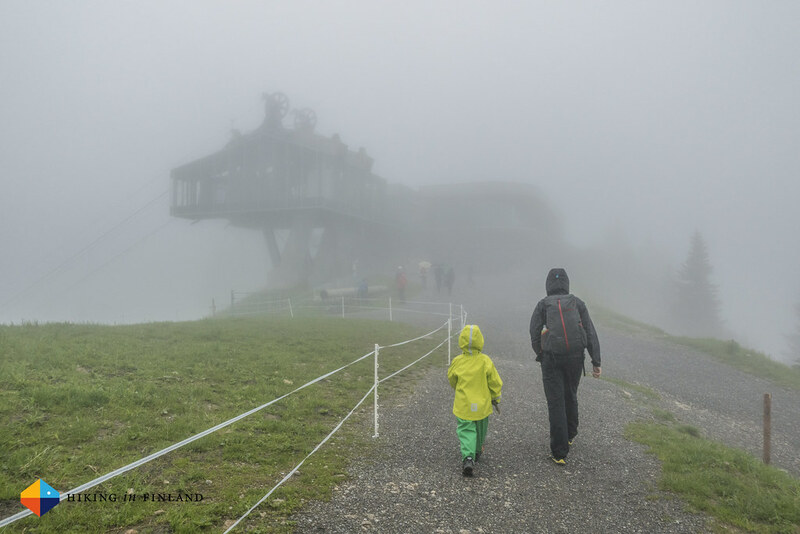 It started with a cable car ride up into the clouds for us four, and we took the pram along - which we then left at the Restaurant as the trail didn’t accommodate a pram (it was very washed out and there were some gates where you would have to lift it over it). 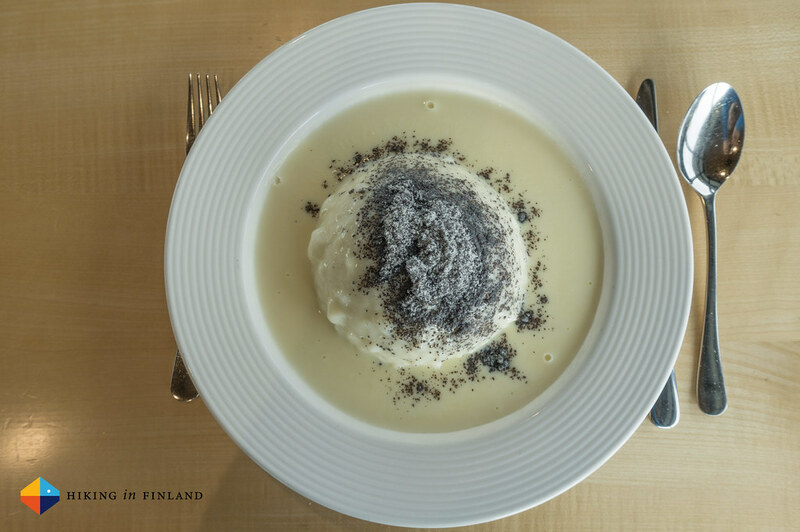 We had a quick lunch - tasty soups and bread - while the clouds were racing around us. As the weather cleared up we made our first start at hiking the Panorama Trail. Then the weather cleared up again and we made our second try. With rain jackets on we left the Restaurant and hiked up the narrow, washed-out trail while a little creek was flowing down. Blue sky started to gain the upper hand and the grey rain clouds moved on to other places. 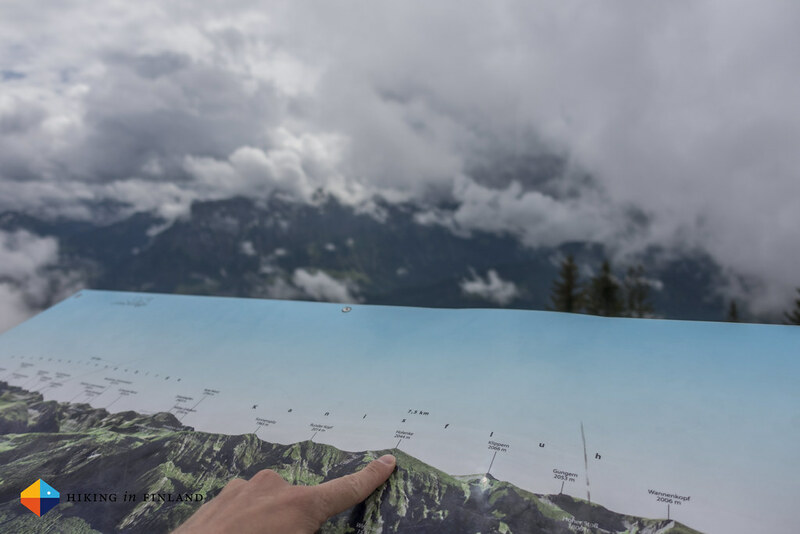 The views on the trail are simply outstanding: Even on this cloudy day you could see the Alps in Switzerland, the commanding Kanisfluh which is the landmark peak of the Bregenzerwald, to the north over the low, lovely foothills of the Alps, the Allgäu and Lake Constance, and then to imposing mountains to the south. 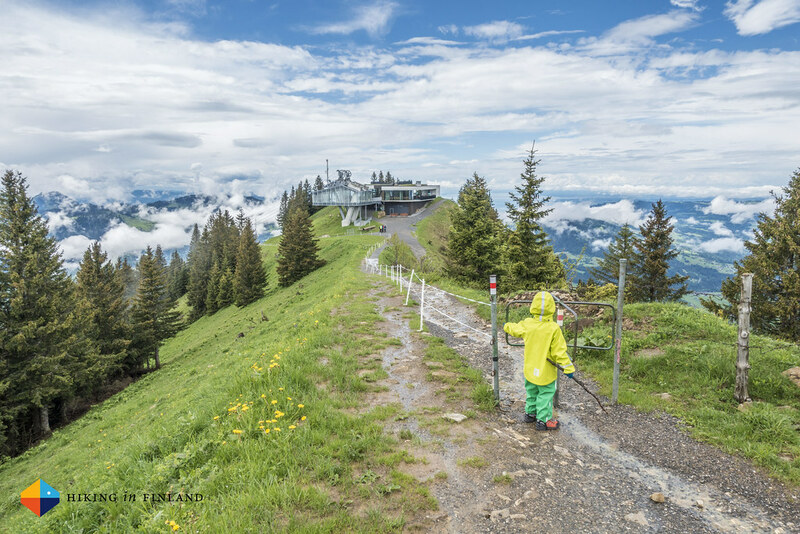 The trail was great for kids, always interesting - from Paragliders that were taking off to sheep - and kept our son in high spirits throughout the hike. 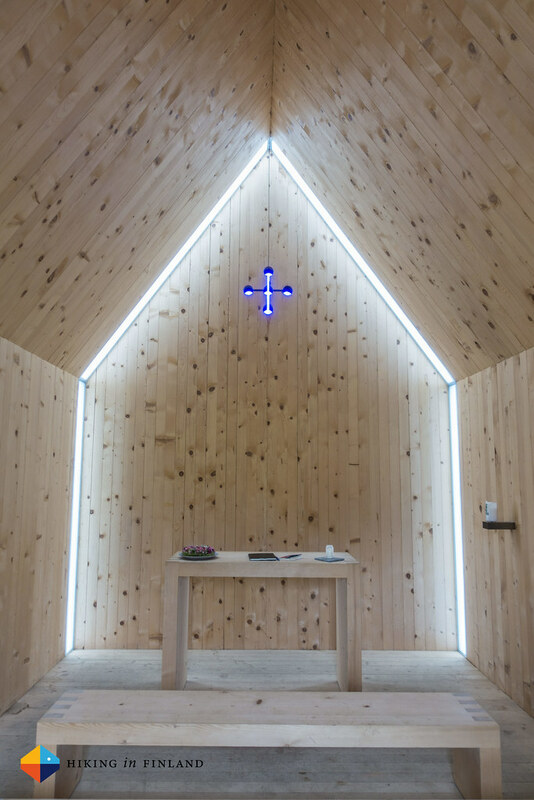 We had a look into the pretty Alpe Niedere chapel which was relatively new before we made the climb back towards the Restaurant and the cable car station. 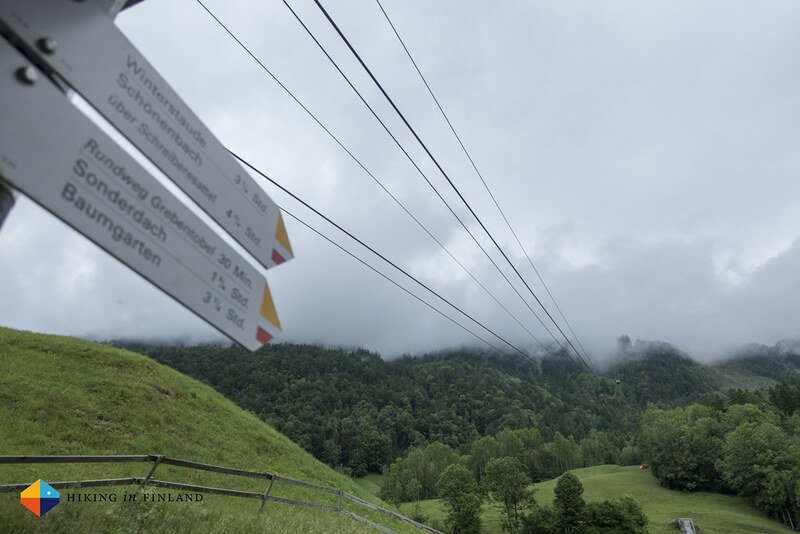 After an ice cream and Germknödel walked over to the cable car station and made the last cable car back to Bezau. 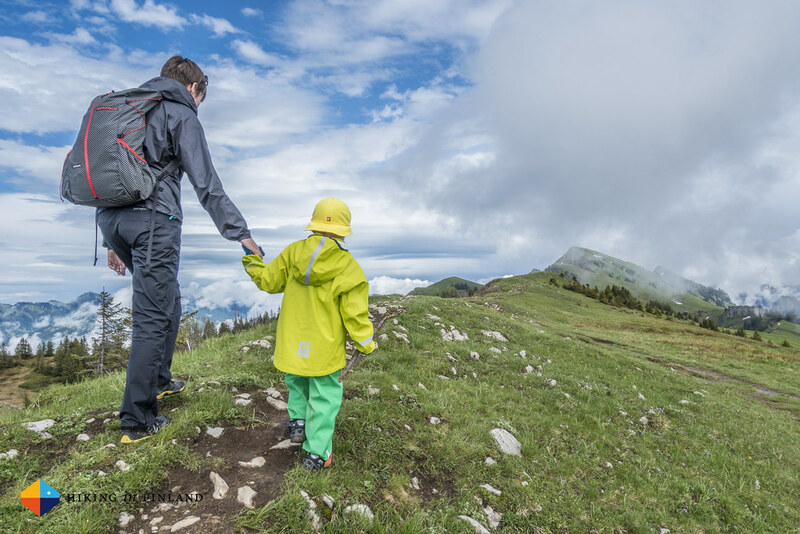 This is a great and easy afternoon or morning out for a family with kids, even in moody weather. 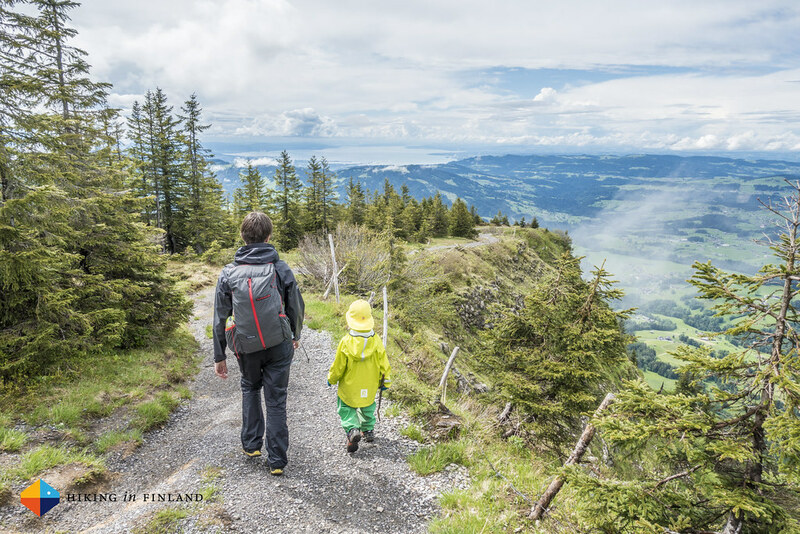 We felt it had all you need for a family hike: Easy access, good food for kids, a spacious changing room, an interesting trail which isn’t too long and stunning scenery. Yes, there was even more on this holiday and I hope to have the final instalment about food and accommodation out next week. 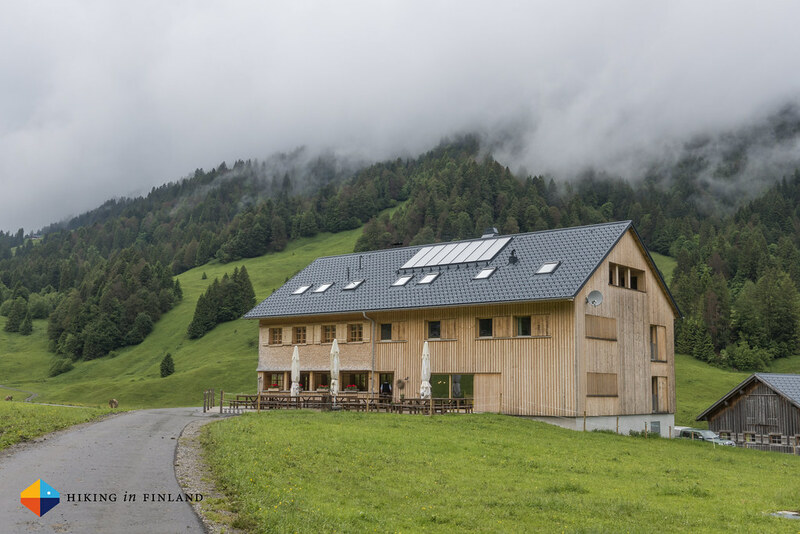 In the meanwhile you can take a sneak peek at the Vorarlberg Flickr Album where you can see a lot more photos from these adventures. And if you enjoyed this post and would like more, why not support me with a coffee or two? I work Full-Time on Hiking in Finland to bring you inspiring trip reports, in-depth gear reviews and the latest news from the outdoors. You also could subscribe to the rarer-than-ever Newsletter and follow along on Instagram, Twitter and Youtube for more outdoorsy updates! 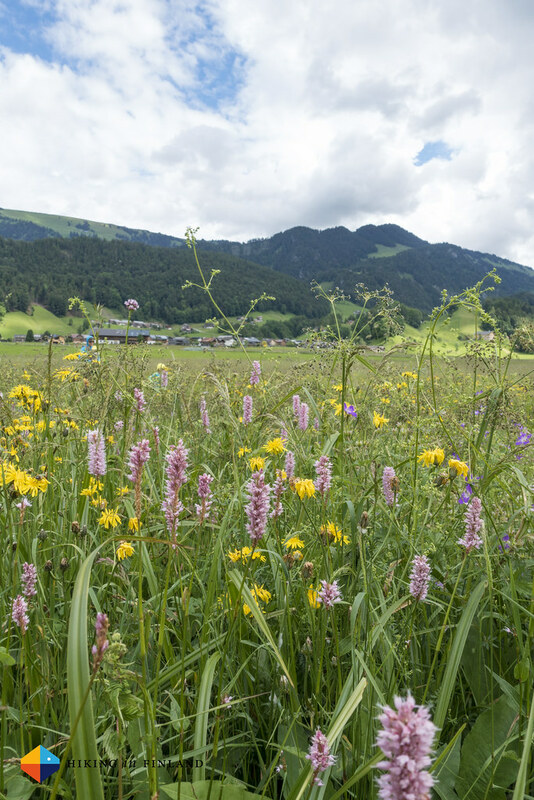 ¹ The Brandnertal does not belong to the Bregenzerwald region, but to the Alpenregion Bludenz which is also part of Vorarlber. 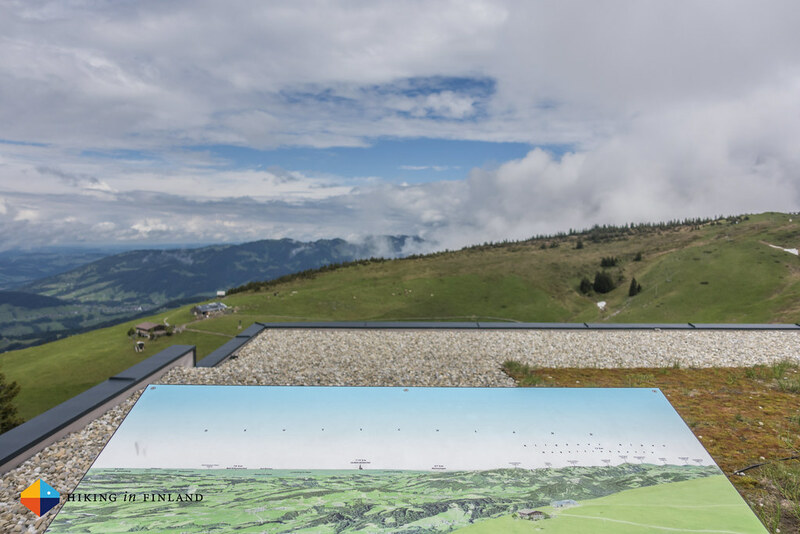 Disclaimer: I thank Tourism Vorarlberg for the invitation to their region. They helped with getting there, accommodation and activities, but as always this does not influence the article as I maintain full editorial control of the content published on this site. Read the Transparency Disclaimer for more information on affiliate links & blogger transparency.